In spring the young leaves are variegated with cream, in summer they are green. 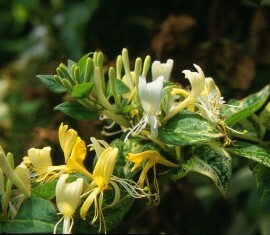 Flowers slender, white, changing to yellow with age; fragrant. Corolla 3-5 cm long. Found as a spontaneous seedling in the collection. It is very look a like L. japonica. This is a very ornamental plant, especially in spring with reddish young shoots and variegated leaves. It never suffers from aphids or mildew due to the hairs on the leaves and stems. Refer normal garden soil, full sun or part shade. Introduction: Fa. C. Esveld, Boskoop, Netherlands 2000. This entry was posted in Collection list. Bookmark the permalink.